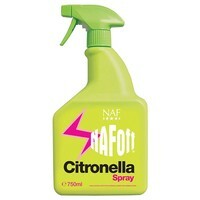 NAF Off Citronella Spray is a completely safe and effective solution to provide long-lasting summer protection for horse’s coats. A concentrated solution that can be applied directly to the mane, tail and coat, NAF Off Citronella Spray will protect against flying pests such as midges, mosquitos and flies. Spray liberally over the coat making sure to avoid the eyes, mouth and broken skin. Repeat as required.